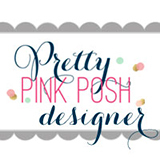 Welcome to the first day of the Pretty Pink Posh March 2019 Product Release Blog Hop! If you arrived here from the Joni Nina Andaya’s blog you are on the right track. Spring has come to the PPP house. There are lots of fresh & beautiful sets in March! I love Spring Frame & Bold Butterflies Dies in particular! I started by die cutting Spring Frame from white card stock. I then coloured all flowers & leaves with alcohol markers. I die cut a butterfly from white card stock using the Bold Butterflies Dies, and then inked up the centre of it with Wild Honey Distress ink. I die cut the Spring Frame from white card stock once more, trimmed off all flowers & leaves. I then inked up the stitched frame with Antique Linen Distress ink, adhered it onto the coloured frame. I stamped the sentiment from the Encouraging Greetings Set on white card base with pigment black ink, and then mounted all elements using foam tape. The leaves with clear droplets look fresher – it looks like spring raindrops leaves! For my second card, I used the Beautiful Butterflies Stamp & Die Set. I heat embossed butterflies from the Beautiful Butterflies Set in gold, watercoloured them with Distress markers, and then die cut them with the matching dies. I heat embossed the sentiment from the Encouraging Greetings Set on red card base in white, then adhered watercoloured butterfly die cuts using foam tape. I embellished with a few Friendship Confetti Mix. There are 4 $25 gift certificates up for grabs (two winners each day). Winners will be picked randomly along the blog hop. Comments must be left by 11:59 PM PST on 3/13/2019. Winners will be announced on the PPP blog. Hello crafty friends, happy Monday. I hope you had a wonderful weekend! As you may know, I’m staying with these amazing ladies on the Pretty Pink Posh design team for the first half of 2019! What an amazing lineups!! I’m so happy & honoured to be in the team! I started by stamping flowers & leaves from the Anemones set on white card stock using light coloured dye ink. I coloured all stamped images with alcohol markers, and then die cut them with the Anemones coordinating dies. I die cut the Scallop Circle from white card stock five times, then stacked them up using fine tip glue pen. I stamped the sentiment from the Encouraging Greetings set on the bottom right of the white paper panel using VersaFine Onyx Black, then mounted all elements as shown in the picture using foam tape. I embellished with a few sparkling clear & raspberry jewels. Pretty Pink Posh January Release is coming soon. I will share my cards with them this Wednesday! Click HERE to see a lot of amazing sneak peeks!! Welcome to the first day of the Pretty Pink Posh November 2018 Product Release Blog Hop! If you arrived here from the Mindy Baxter’s blog you are on the right track. For my first card, I am featuring the Decorative Ornaments Stamp & Die Set along with the Pine Sprigs Die Set. At first, I die cut several Pine Sprigs from watercolour paper. And then I adhered them on watercolour paper panel using fine tip glue pen. Next, I ink blended Twisted Citron & Evergreen Bough Distress inks over the panel using mini blending tool. I spritzed green ink & opaque white ink splatters around the inked areas as well. I stamped the sentiment (from the Decorative Ornaments set) on the right side of the panel using black pigment ink. I stamped some ornaments on a separate watercolour paper using light dye ink, coloured them with watercolours, and then die cut them with the Decorative Ornaments coordinating dies. Once the panel was dry, I mounted it on white card base using double-sided tape, and then added the watercoloured ornaments, clear snowflake sequins, jewels. For my second card, I am featuring the Poinsettias Stamp & Die Set along with other PPP products. I stamped poinsettias on watercolour panel using black pigment ink, coloured them with watercolours. Once the panel was dry, I die cut poinsettias (not green leaves) with the matching dies, and then adhered back in their original place using foam tape. For the sentiment, I die cut stitched scalloped border from white card stock using the Stitched Borders 2 dies first, and then stamped it (from the Holiday Greetings set) with black ink. Thank you so much for stopping by. Happy holiday crafting!